Annie Maude Ellwood was born in Staveley, near Kendal in Cumbria, on 10 January 1896. Her father was a bobbin turner, and she left school at the age of 14. According to a letter in her service record file (WO 398/69), she first became interested in wartime military service in February 1917, when - in response to a government advertisement in the Yorkshire Post - she wrote to the National Service Department in London offering herself for service abroad. Ellwood's original application form to the National Service Department in March 1917 shows that she had worked for the previous nine months as a clerk. Despite the general book-keeping skills that she had learned through a correspondence course in 'commercial training', her employment prospects were apparently uncertain: 'I am daily expecting to be thrown out of work as I work with a firm of theatrical printers who are partly closing down on account of the new paper restrictions.' This uncertain situation probably explains Ellwood's keenness to begin any form of paid wartime service. 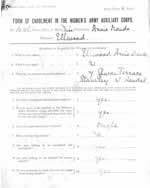 After passing a medical examination, Ellwood enrolled as a clerk in the newly created Women's Auxiliary Army Corps (WAAC) on 8 May 1917. Within the space of three weeks, she had departed for France, where she remained - except for leave periods - for the next two years. Ellwood's file does not give much detail about what she actually did during this period. According to her casualty form (active service), she worked in clerical posts at various British army transport depots, most notably in Abbeville. Ellwood's period of service in the WAAC, which was renamed the Queen Mary's Auxiliary Army Corps (QMAAC) in April 1918, extended beyond the end of the war in November 1918. She does not appear to have left the military transport depot at Abbeville until May 1919, after which she was given another clerical posting at Calais. Following a two-week period of sick leave in England in July, she was finally discharged from the QMAAC in October 1919. One of the last documents in her file is a short letter, presumably written to the War Office, acknowledging receipt of her discharge certificate.